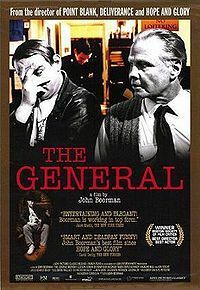 The General is a true film about Dublin criminal Martin Cahill, who pulled off several daring heists in the early 1980s, and attracted attention from the Garda, IRA, and UVF. The film was directed by John Boorman, filmed in 1997 and released in 1998. Brendan Gleeson played Cahill, Adrian Dunbar played his close friend Noel Curley, and Jon Voight played Inspector Ned Kenny.